A simple a nd at the same time profound poem wrapped in bold illustrations that tells us that we are not what we appear to the naked eye. An invitation into a journey beyond appearance to discover who we really are. My nose is tiny and gets lost in my face, but it can smell cookies two blocks away. WINNER OF THE 2013 ASTRID LINDGREN MEMORIAL AWARD / RIGHTS SOLD: French; Portuguese (Brazil) & Italian. 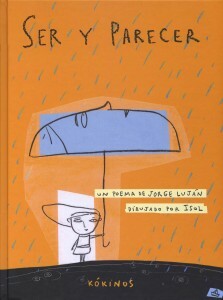 Jorge Luján is a renowned poet and writer who offers the reader a text open to endless interpretations. Isol won the Astrid Lindgren Memorial Award in 2013. This entry was posted in Picture Books and tagged Astrid Lindgren Memorial Award, Awards and Prizes, Editorial Kókinos, Isol, Jorge Luján on October 1, 2014 by sbarrouillet.